We are an eclectic bunch of video enthusiasts who practice what we preach, we speak video! 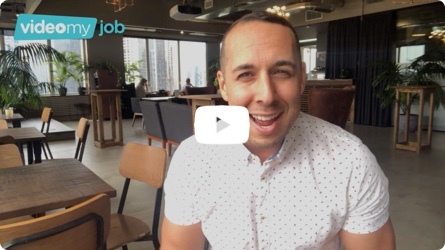 Our founder, David Macciocca, ran a successful boutique recruitment agency for 10 years, where he experimented with video job ads - the results were electrifying. He set up a production studio and started to film every single job he was recruiting for, the rest, as they say, is history! Globally, video now accounts for more than 50% of all online traffic and is 1200% more likely to be shared online than text or images. The human preference for video is so strong that YouTube is predicted to overtake Google as the world's favourite search engine. So it is no surprise that people professionals are turning to video to transform the way they communicate internally and externally to candidates and employees all over the world.